Hailing from Benin, West Africa, Orchestre Poly Rythmo de Cotonou has been churning out incendiary Afro grooves since 1966. 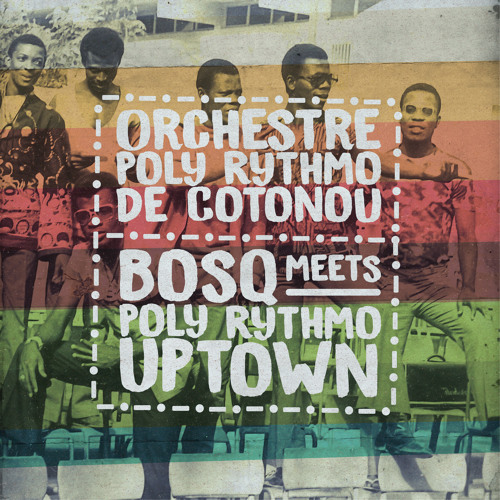 On ‘Bosq Meets Poly Rythmo Uptown,’ Bosq tastefully reworks 4 of Orchestre Poly Rythmo’s legendary recordings. As a die-hard fan, Bosq took a subtle approach to the project. According to him Orchestre Poly Rythmo has been a strong influence on his work and he wanted to be respectful to the original tracks. Bosq focused on making the tracks DJ friendly by beefing up the low end, rearranging and stretching parts out, and adding in extra percussion and a drum machine. The result is a 4-track EP of bumpy Afro disco, psychedelic funk, frenzied Afrobeat, and sunny soulful grooves. Based in Medellin, Colombia, Bosq has released a collection of music on Ubiquity Records, Soul Clap Records, Fania Records, Razor-N-Tape, and more. Since 2015, Sol Power Sound, out of Washington, DC has released deep sounds inspired by rhythms and traditions from around the globe. The label’s output includes Afro-Latin stompers, re-edits of lost disco grooves, heady percussive tech workouts, and other sonic treats. Four stone-cold classic Orchestre Poly Rythmo de Cotonou tracks re-shaped by Bosq for the dancefloor today.